Have stayed here many times and always a delight, the view of the Se Pian Wetlands, the local village and sights are always great. The food and staff are great. ...and on the whole it really wasn't, but also was not worth the money or efforts the get to the property. The food on offer wasn't terrible, but the prices were too high for what they were. The staff were really amenable and did offer us things that were perhaps outside of their normal offerings. The bungalows were nice to look at, but they smelt of the septic tank. There were constant movements of giant ants on the beds. There was a disappointing amount of single-use plastic. The mattresses were very uncomfortable and made for a very bad sleep (we ended up covering the springs up with extra blankets). The scenery was still nice, and the grounds are very clean and you can see some nice wildlife on the property. This place is very difficult to get to and from, we ended up hitchhiking and walking a few km. All in all, I probably would not recommend despite the good things as it is too expensive for what it is and is painful to get to. The best time spent there. Very nice to stay here with closed to nature. quiet atmosphere and kind staffs. Rooms were well designed and maintained. Geat view of wet land from the bangalow. Karaoke neaby was a little bit noisy. Bungalows are clean and comfortable. The place is very quiet, especially around lunch time. There is a nice view from the balcony, and we saw 2 elephants in the field. The major attraction of this area is the amazing elephant ride at a very reasonable price, offered by the village people. The lodge is just next to the village, inside the National Protected Area. The lodge has also a viewpoint where you can observe buffalos, cranes and sometimes elephants. We stayed in the bungalows with shared bathrooms, at a reasonable price. We did not select the ones with private bathrooms and balconies, which seem to be a bit overpriced at a Laos standard. It was a nice Eco lodge and we were able to do trekking with a native guide who was knowledgeable of jungle, plants and animals. But location is so remote that we had such hard time getting transportation back to Cambodia. The staff there would not do any bus arrangement like most of guesthouse so we had to manage ourselves without good laos communication. They said they did call bus company to stop at 48km closest to the lodge on the main road but bus did not stop for us so we had to take a local bus to get the border and hoped to catch any bus to move on to Kratie. Our suggestion for next people to have already bus arranged before getting there or go to parse or 4000 islands stop to get on bus. It was such a scary experience since there was only one daily bus to Cambodia in early morning. Also I had to mention that if you are staying in the shared bathroom Bangalow it will be so thin walled that you can hear everything and not too comfortable. And mattress is too wore off to be comfortable. Owner has only 1 importancy : money! Very unfriendly for staf and no interes in the guests. Room and balcony: clean on the surface, but dont look further away! If there will come other good possibilities to overnight in Kiatngong, dont go to Kingfisher! The lodge is great. Fantastic rooms, good food in the restaurant,Great to watch the elephants, nice and helpful staff. However, the mattress i had in my room (11) was a disgrace. It was lumpy and very uncomfortable and would collapse if you sat on the edge (needs replacing ASAP) I would have given this place 10 out of 10 but for this. Friendly, capable staff help to make a stay at this great hotel a real pleasure. 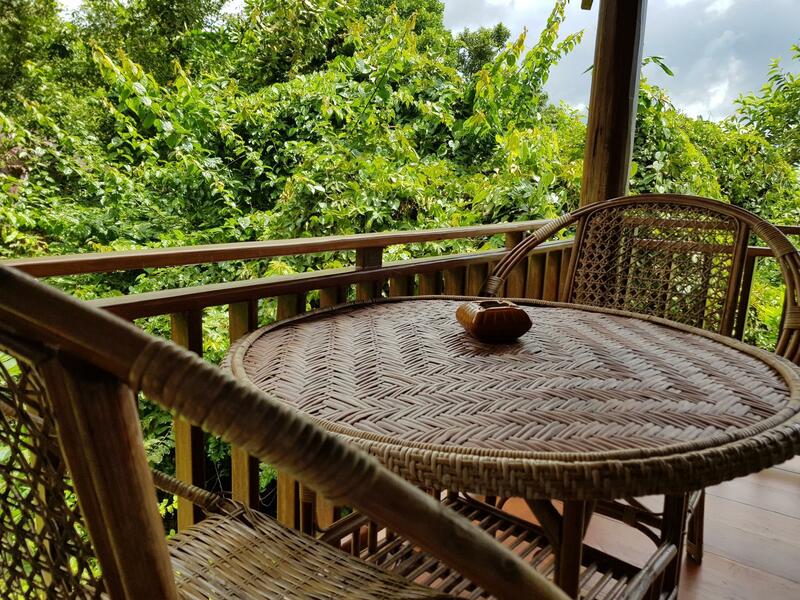 Bungalows are well designed in line with the environment (inside a national protected area, so don't expect any nightlife apart from the insects! ), and great care is taken to minimise the 'tourist' footprint. Bungalows are very well thought out with plenty of hooks and rails in the right place! The Lodge is supportive of the local community and gives very clear info. on the way charges for local services are shared with the commununity. I've stayed at Kingfisher several times, and never been disappointed. The rooms are basic, but very comfortable. The restaurant serves the best Lao food in the south of the country, and the staff are helpful and friendly. If you're not comfortable with critters and insects, this may not be the place for you. There are lots of insects, reptiles and amphibians around - including large geckos in the rooms. As long as you go in expecting that and knowing they won't bother you, it should be an entertaining part of the experience. Hikes arranged by the lodge are well-planned and usually good value. Stayed for three nights, one day on elephant trek through forest, one day relaxing and watching birds in the wetland. The accommodation - comfort bungalow - ws excellent, clean and comfortable, the staff were exceptionally friendly and helpful. Not cheap by Loatian standards but well worth it. great stay. amidst pure nature. it's like a serene hideaway that's nestled in the middle of green fresh rice field. everything is unpretentious. buffaloes are walking to work at dawn. no television and refrigerator so it's a disconnection from the world we are used to. nice stay but a bit too many insects and lizards, which really can't help. bring a good book with you. you will have plenty of time. very far from any attraction in champasak town. i think the hotel should arrange the transportation to get there from the main road. we were a bit lost and didn't know how to get there. Very nice ecolodge with amazing activities with elephants! The view from the bungalows is amazing and herds of buffalos pass by twice a day. Nice rising sun and you can also see some elephants from the view point. The food is great also. The bungalows are really nice and comfortable, but the room with shared bathroom are not great for intimacy. tres decevant en saison seche: pas d eau donc pas d animaux ( ce que j esperai.....) Aucun pick up de l hotel si vous venez par transport public...... Les activites proposees sont cheres.